Short Business Description: We provide wellness solutions by providing the world’s most advanced nutraceuticals. We also provide customized supplementation and related wellness systems and solutions using isotonic capable products. Our team can show individuals and health professionals how they can utilize our proven systems & products to help others maintain a happier and healthier life. 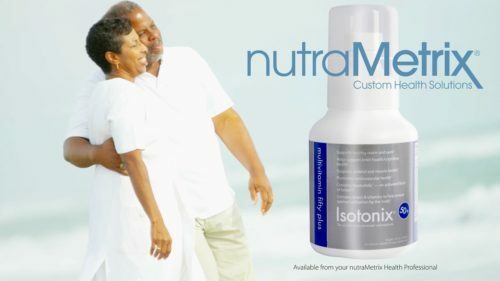 Everything you eat and drink, including nutritional supplements, must be made isotonic before passing into your small intestine where it can be absorbed. “Isotonic” means having the same fluid pressure as your other bodily fluids like blood and tears. When you eat food, drink a beverage, or take a pill or capsule, your stomach must first secrete diluting juices, enzymes, hydrochloric acid, and at least one vitamin-binding protein to continue the process of digestion. Muscular contractions of your stomach then mix the contents until a reasonably uniform solution is achieved. This process can take anywhere from 40 minutes to four hours. In the time that it takes for most pills and capsules to disintegrate, and their contents to dissolve and transform to the proper isotonic state, much of their effectiveness is lost. During digestion, the important micronutrients in pills and capsules can get trapped by fats, fibers, and tannins or inactivated by the highly acidic pH level of your stomach. By using our products, systems, mentoring, etc we can show both health professionals and health minded individuals how to help others while creating a very impressive income. This income can be added on top of what they are currently earning.